The Washington City Paper's daily e-letter calls our attention to the Mark Lee column in the Washington Blade, "Is D.C. destined to be the domain of the well-to-do?" Apparently, last fall I wrote a similar "blog entry in response to an article in The Atlantic, titled "Will D.C.’s Housing Ever Be Affordable Again?" My answer was no, but with a more detailed analysis than the one below. The fact that so many people write similar articles is an indicator of the need to move from lament to solutions. Also see "Canada's Housing Crisis: Twenty-Two Solutions" from The Practical Utopian blog. 1. For historical reasons, when legacy cities like Boston, Chicago, New York, Philadelphia, and Washington were built out during the primary period of growth, pre-1920 especially, in comparison, DC had much less population therefore much smaller buildings were constructed. This has major consequences more than a century later. 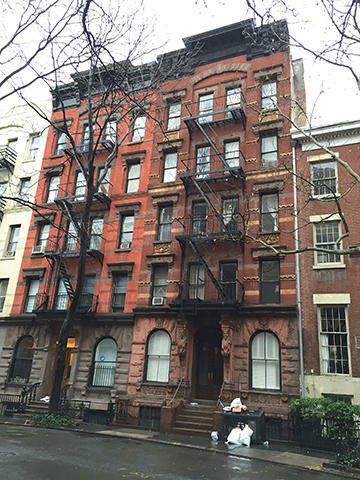 A tenement building in Manhattan can house multiple families, while the same amount of space for two tenements in Manhattan would cover three small two-story rowhouses in DC. 2. For a long time that wasn't a big deal, because demand was commensurate with the inventory--even less than the available inventory. 3. But finally around 2000-2005, the trends favoring urban living finally hit critical mass, and urban living became appealing to many more segments of the housing market. Now having three story apartment buildings from the 1920s instead of six-story tenements, small rowhouses instead of big rowhouses split up into apartments, building most rowhouses without English basement apartments, medium sized apartment buildings (four to six stories) instead of larger, elimination of alley dwellings and restrictions on constructing carriage houses on the back of properties, etc., means that the available inventory of rental and owner-occupied housing is significantly smaller than the demand. These DC rowhouses are larger than the typical two-story rowhouse constructed before 1914 because they were built with basement apartments. (Google photo). That's why prices keep rising. 4. Because of DC's limited housing stock, even small marginal increases in demand, led and lead to significant price appreciation. 5. And each new addition to supply isn't enough to meet the latent demand, so housing prices continue to rise regardless (plus the fact that new housing, constructed at current prices, is always priced at the top of the market). 6. Because of DC's limited housing stock, people wanting to live in the city were driven to consider neighborhoods (H Street, Trinidad, Petworth, Shaw) that they weren't originally willing to consider, because they were priced out of more popular neighborhoods such as Capitol Hill, Dupont Circle, and Georgetown, extending price appreciation and demand outward. 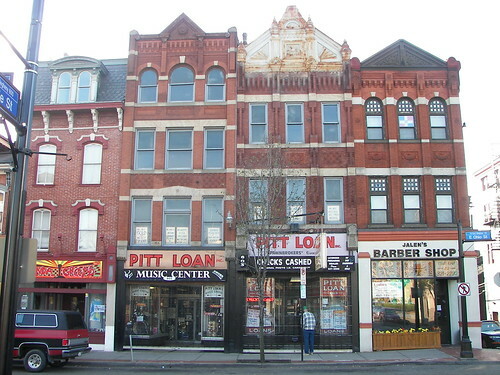 This grouping of mixed commercial and residentially-used buildings on East Ohio Street in Pittsburgh are far larger than the buildings typically constructed in DC's commercial corridors outside of Downtown, Georgetown, and Dupont Circle. 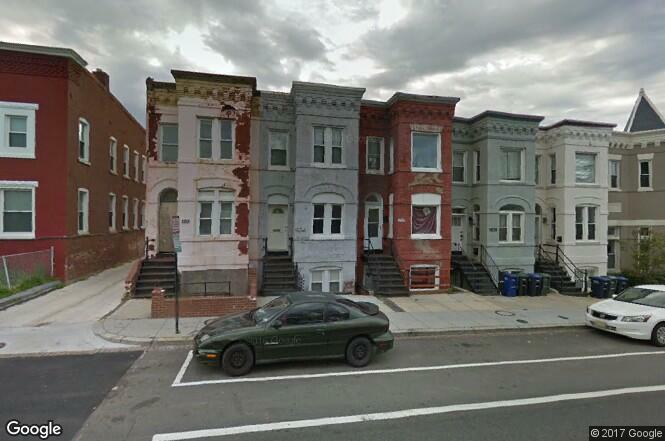 It's rare for there to be a 3- or 4-story building in a DC neighborhood commercial district constructed before 1940. This leads to housing appreciation in neighborhoods that may have remained "affordable," had there been more housing options available in those neighborhoods more highly preferenced. I wrote a few years ago in "Exogenous market forces impact DC's housing market," about how because more neighborhoods in DC have been integrated into the residential housing market "at the metropolitan scale," people shouldn't be considering solely within DC criteria and characteristics shaping neighborhood and housing attractiveness and pricing. I haven't seriously delved into the list of housing priorities created by a group of business and housing advocacy interests, touted in posts in Greater Greater Washington ("Diverse groups agree: DC needs more housing and more affordable housing now" and "Meet the housing demand: A priority for DC housing"). My initial reaction is that of course housing prices are going to continue to escalate and people of lesser means are going to be pushed out of the city, because regardless of good intentions, most residents seem to oppose the kinds of development measures that would take the edge off (but not eliminate) the ongoing upward repricing of DC's housing stock in most neighborhoods west of the Anacostia River, and increasingly in neighborhoods east of the Anacostia River. In short, in capitalism, people with more money bid up and acquire scarce resources ("Low income, high income, the market and the right to the city"). In DC, high quality housing and neighborhoods ("The eight components of housing value") are scarce resources. So people with less money are not equipped to compete for attractive housing, even with extranormal assistance. I have been calling for a real housing plan for at least 10 years. My biggest lesson from the past 16 years of change in the city is that not being armed with good plans and vision at the outset of change/growth opportunities puts you seriously behind the market, and without the ability to shape change the way you want it. We had no idea on what kind of change and the velocity of change that was unleashed by Anthony Williams becoming mayor, coincident with a reaching of critical mass interest in urban living. Not having robust proactive plans in place such as a good Comprehensive Land Use Plan, a good housing plan, a plan for WMATA, etc. put and continues to keep us really really behind. As a result, it's almost impossible to change the trajectory as it relates to housing affordability. One, many companies don't want to get involved, but are happy others are. Some build affordable housing as a regular part of the portfolio, e.g., Related Companies, and make a lot of money doing so. Other companies focus on it, e.g., WC Smith, and do a great job. - not enough do people discuss the benefits of growth, one is that adding density supports amenities development and provision which makes neighborhoods more attractive and convenient to live in, e.g., H St., Columbia Heights, Petworth, and Capitol Riverfront/Barracks Row are the best examples in the city, maybe on a different scale, Takoma, where the addition of small amounts of multiunit housing at the core have led to a significant strengthening of the retail offer, mostly restaurants sure, but also the addition of a hardware store, etc. - land tenure issues in mixed use communities, specifically adding owner occupied housing to mixed use districts, specifically condominiums, may have unintended long term consequences in terms of quality of design and willingness of future owners to pay special assessments for upgrades -- get it right the first time or problems can result. - condominiums can be a problematic ownership structure for smaller properties, or in lower income areas, as the properties age, and if there are problems on the part of owners paying assessments, and the increasing cost of maintenance leading to assessment increases, making it difficult to stabilize the properties. Below is the list of what DC's housing priorities should be according to the statement. My reaction is still more, "yeah, yeah, whatever." For example, in order to "meet the housing demand" and "equitably distribute housing" and "utilize areas near transit" you need to take practical steps as identified above. Now, it's all nice language with little practical import. ● Meet the housing demand.​ Through the Comprehensive Plan, the District should forecast, plan for, and encourage the creation and preservation of a supply of housing (market-rate and subsidized affordable) to meet the demand at all income levels. The supply of housing should be sufficient to slow rising costs of rental and for-sale housing. ● Equitably distribute housing. T​hrough the Comprehensive Plan, the District should fight against segregation, foster equitable access to opportunity, and comply with Affirmatively Furthering Fair Housing (AFFH) priorities. The District should require that every part of the city participate in adding housing to meet the need for all income levels, with an emphasis on transit and commercial corridors. ● Include families.​ The District should be a city that houses people of all income levels and of all household sizes, including families. Through the Comprehensive Plan, the District should promote the creation and preservation of 3+ bedroom units along with other housing types. ● Prioritize affordable housing as a community benefit.​ When rezoning or granting significant zoning relief, the District should affirm through the Comprehensive Plan that affordable housing (in addition to any underlying requirement) is the highest priority benefit and that other community benefits should be long-lasting. ● Preserve existing affordable housing.​ When redevelopment occurs on properties with housing made affordable through subsidy, covenant, or rent control, the District, Zoning Commission, and neighborhoods should work with landowners to create redevelopment plans that preserve such units or replace any lost ones with similar units either on-site or nearby. These entities should provide the necessary density and/or potential funding to ensure it is financially feasible to reinvest in the property with no net loss of affordable units. ● Protect tenants.​ Through the Comprehensive Plan, the District should ensure that when affordable housing is undergoing redevelopment, tenants have a relocation plan, are allowed to continue their tenancy with minimal disruption, and will have the right to return to their units or an equivalent replacement. Whenever feasible, redevelopment should observe build-first principles. ● Support neighborhood commercial corridors.​ Through the Comprehensive Plan, the District should encourage the success of neighborhood commercial corridors and locally owned businesses, especially in disadvantaged communities. This includes increased housing density that supports businesses and providing equitable opportunities for locally owned businesses in mixed-use and commercial developments. ● Clarify zoning authority​. Through the Comprehensive Plan, the District should affirm that the Zoning Commission has the purview to allow increased density for Planned Unit Developments that supersedes the levels in the Comprehensive Plan’s maps in exchange for community benefits. ● Improve data collection and transparency. T​ he District should provide the highest quality public data. It should standardize housing-related data collection across agencies, and release all data and forecast analyses to the public, to facilitate transparency and regular reporting on the status and progress of housing-related programs. Data should include a comprehensive housing database and demand-based forecasts alongside existing supply-based (pipeline) forecasts. The other thing the authors are kindly overlooking is the size of the affordable housing market. I've been looking at Denver. It is about the same size as DC (700K); and has taken over from DC as the fastest growing city (1000 household a month). (The Metro area is probably much larger, I don't know Denver well). Denver itself it adding a lot of housing; 5000 from 2012 to mid 2015, and another 5000 coming online. Again DC itself is adding maybe 12K a year. About double what Denver is doing. Claiming DC has a supply issue is silly. If anything, too much is being built in DC. Denver, as you saw, has a stronger demand. (And again, to be fair, I'm seeing a big spike in Denver rents starting in 2014 which may reflect a lack of supply in denver). The problem in DC is that a good half of rental housing is Section 8 or increasingly income limited, which is driving up the price of the other half. Denver is spending something like 6M on affordable housing -- what is DC spending? 300M? 400M? And sure, you can argue about state money, but in denvers case that is again maybe 7M or so. Richard you missed our great exhibit "The Triangle Known As Truxton Circle" which would have challenged some of what you've written here. Maybe the Truxton Circle area is an anomaly but a majority of the housing stock remained the same with the biggest change being a mixed use block changing into the affordable/ Section 8 taking Northwest Co-op. The houses are townhouses or 2 flat townhouses, with a few small apartment buildings here and there. NW Truxton Circle was at its highest population in 1940 with 8,242 people, the last census 2010 had us at 3,028 (see http://blog.inshaw.com/2017/02/change-in-truxton-circle-1880-2010.html for all the numbers). Housing stock plays "a" part but not the major role in explaining 5,214 difference. Demographic trends play a greater role than the built environment. When you look at the census rolls there were more people in one house or unit than would be socially acceptable now. The amount of square footage the average American demands is 2x as much as the average person in say 1930 needed. Also those 3+ bedroom units are going to adult roommates who make something unaffordable for a single income family of 4, affordable for 3+ working childless adults who split expenses 3+ ways. The built environment can only do so much, it is the people who bring the complications. I'm sorry I missed that exhibit. But I'd say it doesn't "challenge" per se some of what I've written. I am familiar with census data in the H St. neighborhood from the 1880s through the 1920s and it had the same pattern of much higher household sizes, with boarders, relatives of the head of the household (usually a man) or the wife, etc. A big reason for the "need" for more housing is the decline of household population size. So you need more units to house the same number or fewer number of people. ... but I think that while we come at this from different perspectives, we are closer in thought than you think. Like with charlie, my thinking-writing is the better because of interactions with you and he. (e.g., this piece is in response in part to one of your points... http://urbanplacesandspaces.blogspot.com/2012/12/in-lower-income-neighborhoods-are.html and I am still reasonably proud of the analysis, although it needs some re-working). Hmm, I don't think I am being direct. Thank you for continuing to read and comment on my work. will have to think about the Denver example. I can't believe in my list of elements, I left off the height limit. I think a lot of the problem has to do with the height limit today and a general suppression of building heights historically, not for policy reasons but because of (lack of) demand. I took some photos of some buildings in my greater neighborhood over the weekend and will put together a short post about the "density" issue. Between the historical fact of the relative small size and unvariegated housing stock in most neighborhoods + not building more housing as part of various public housing projects (which does have the problem of concentrating poverty and negative behaviors and problems) we have some gaps in the housing market that shape its pricing in significant ways, and opining about whatever we need to do to "help the (affordable) housing market" misses the point a lot. ... one of my e-correspondents who reads the blog but comments through email to me made the excellent point that in GGW, the writers and commenters aren't so much interested in "affordable" housing for the extremely impoverished and impoverished, but for younger, employed demographic segments that aren't making enough money to buy houses and condos is DC's particularly strong housing market. I'd agree there is tremendous confusion over at GGW at what "affordable housing" is. Right now the 'rent is to damn high" and the affordable housing folks think they are the same boat. Clearly GGW leadership has decided to go with the affordable housing crowd and push for more homeless shelters, public housing, and income limited. I'd say the beef with the RITDH crowd is really monetary policy, not housing. Pushing up real estate asset prices makes it very difficult to enter the equity ladder. If I had bigger balls I'd short equity residential. Mari's research as usual is excellent. We are seeing that level of overcrowding right now is suburban areas where you've got 6 hispanic men in the same 2 bedroom. Hell, even on 14th you've got 4 people in some of the luxury units. in the line of follow up entries, I was thinking about Mari's comments and it made me realize that ADUs/flats are a way to "add to housing supply" using the same basic footprint of a house/lot but in line with today's SOP concerning household composition and size and land tenure. Back then, you didn't really need separate ADUs (except as a result of segregation) for the most part, because so many people lived in each house. 2. wrt shorting Equity Res. My brother and I were arguing about investments and "the long run" and the kind of beliefs I espouse. I made the point that I realize the way I think about stuff has nothing to do with short term cycles in stocks, that thinking that way gets in the way of making money. e.g., the biggest lesson I ever learned about elections was believing Carter would beat Reagan. He didn't, and immediately after the election, defense stocks skyrocketed. Had I had the money (I was only 20 years old but I wasn't as hard headedly objective as I am today), obviously I would have put it into defense stocks. Anyway, while you may be absolutely right about the long term fundamentals concerning the rental market and how they might effect/affect ER, the problem is when. This six month period? The six month period starting in 18 months? Etc. The other thing is that I don't pay close enough attention. If Sam Zell is no longer a heavy hitter in terms of ownership, then it's fair to say that asset class no longer is the way to play. He's good and getting in and out. Maybe not at the scale of a Soros, but he's quite prescient. Generally (cf. Tribune, which he helped to f* up big time, tragically--as I care about newspapers). And I don't know enough too about the fundamentals in terms of is it a REIT. E.g., Tribune Newspapers (TRONC) is f*ed now because in the demerger, the broadcast company kept the buildings owned by the newspapers screwing them for the future like Mervyns and other entities that separated the real estate from the business, giving them less flexibility with material changes in conditions. The other thing is that some companies have such good financing that in bad times, they have the money to take advantage of the companies that don't. In the last recession in fact, Equity Residential was one of those companies. They got lots of properties for a song in this city and elsewhere, as a result of other companies being overextended. Same with Bozzuto, both in terms of their development and management arms. And perhaps the premier firm on this dimension was/is Brookfield, both in commercial and residential property. If ER is similarly situated as a business now, then I'd be hesitant to short their stock. the ability to finance to everything. And as outsiders we don't have much ability to know that. And it also goes that very difficult for one person to hedge against these sort of macro risks. That all said, I'm watching the multifamily space with a great deal of nervousness. I've noticed in DC in my price range (600 to 700) about 10x the volume of sales compared to 2016. People are cutting price to move it. a guy I used to work with on H Street issues used to buy natural gas futures. Then came fracking. He lost a lot of money as the fundamentals of the industry changed completely. Not many of us can time so well those exogenous-quantum scale changes, unlike George Soros. well it is more a comment -- like Robert Schiller -- that an individual can't participate easily in those macro trends. Schiller points about the housing prices are extremely volatile in any given market (they aren't supposed to be nationwide, until 2008, and even then it was really about 5 states). So he wants to ability to hedge your house price (primary asset) against that reduction, as you don't have a lot of control of selling that asset. I should add that apparently the Big Short these days is actually Class B and C malls, not multifamily. Oh yeah. But I've been meaning to write about that because some malls you'd think would be okay aren't, like Lake Forest, and some that you think are doing badly are fully rented, etc., but because they appeal to ethnic demographics (e.g., the shopping district in Takoma Langley, which focuses on Hispanics), people of the majority might think they aren't doing well. There is still room for malls. But it's like commercial properties. Some office buildings owned by major firms are being given to the servicer, while other buildings better placed such as in Reston and Tysons, are doing fine. And there are plenty of failing multiunits, but not necessarily in good submarkets. Oh s***. Even in Downtown Baltimore, Class B buildings are selling for as low as $40/s.f. Think if I had my s*** together and focused on making money the past 15 years, I'd have been in the position of buying a downtown office building! Richard don't be fooled by the cheap acquisition price of downtown B'more. I have a property near downtown that contractors are slowly (slower than dead snails) making the property usable. The other thing to remember is Baltimore is not DC in oh so many ways. It was an office building I was talking about.